I made this over the 4th of July, and loved the simplicity of it. This super delicious, cheesy tart comes together quickly, takes advantage of the lovely summer tomatoes, and looks impressive enough for company. As the saying goes, it’s easy as pie. I think this would also work well as a galette…which might make it perfect for making at the beach, where pie pans are not always available, but the most delicious farm-stand tomatoes are. Plain goat cheese gets some extra flavor from rosemary and lemon zest. You want to be careful to squeeze out the seeds/juice from the tomatoes before layering them on the pie. Too much liquid and the pie will be soggy. Preheat oven to 350°F. Line 9″ pie dish with pie crust and pierce the bottom with a fork. Set aside. In a bowl, beat together goat cheese, rosemary, salt and lemon zest. Layer goat cheese mixture into the bottom of the prepared pie. Cut the tops of the tomatoes off and carefully squeeze the juice/seeds out. Slice tomatoes. 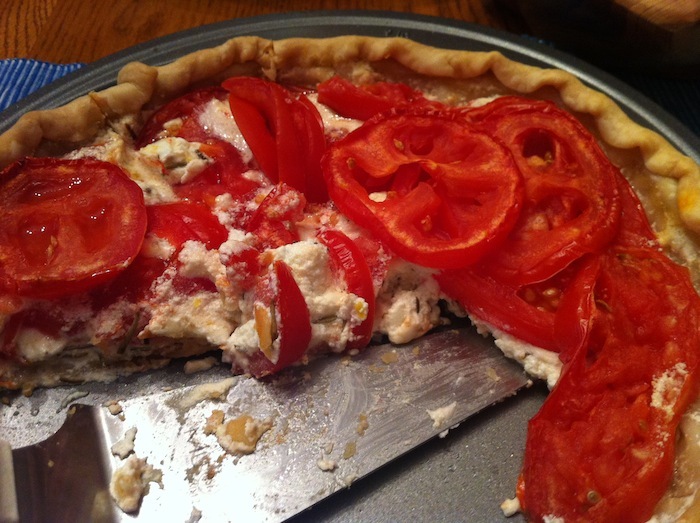 Layer tomatoes on top of the goat cheese layer, until pie is filled. Sprinkle with a little kosher salt. Bake for 40-45 minutes, until crust is golden and tomatoes are soft. Remove from oven and let stand for at least 30 minutes before serving (I couldn’t wait that long, so my slices kind of fell apart, but they still tasted delicious! ).